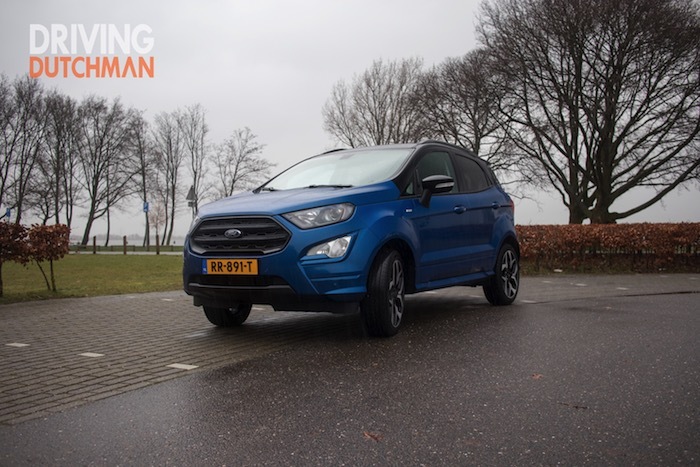 Home ENGLISH REVIEWS Driving test Ford EcoSport, the most authentic (B)-SUV? Ford has the EcoSport for the first time since its introduction in 2014 a facelift. And a big also. More than 2,300 parts are new and the production was moved from India to Romania. “Significantly shorter transport times, European quality and Made in Europe sounds better than Made anywhere Else,” says Ford. We were at the Dutch introduction, and made a brief introduction to the ‘new’ B-SUV. Since 2014 has Ford ‘m in the program: the EcoSport. Since that time there have been some minor updates, but now Ford is rigorously addressed. These must succeed, the segment is immensely popular with buyers and want to Ford a piece of the action. There they must compete with a number of successful competitors such as the Renault Captur, Hyundai Kona, Kia Stonic, but also the Dacia Duster. To make the EcoSport a rugged SUV styling, Ford a robust, high-ranking trapezevormige grille and voyante angular headlights fitted. The shape of the headlights coming in the opposite form in the housing of the fog lights. 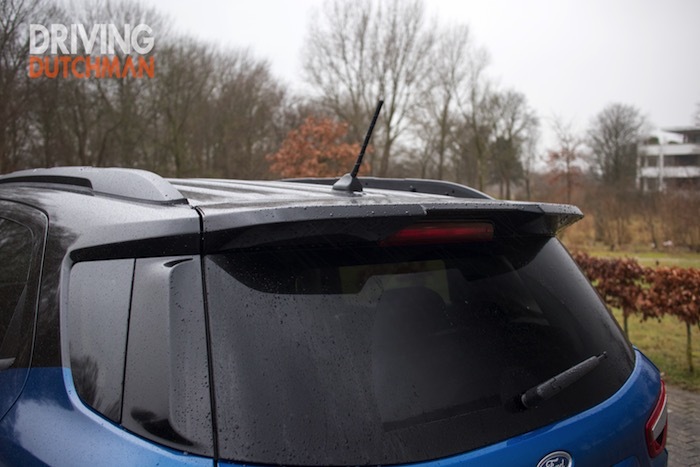 The EcoSport is even more dynamic, the performance is out of sight under the high sloping hood placed. To the rear is the bumper construction taken, the taillights beautifully dark ‘glass’, and the spoiler has grown. Of the most luxurious ST-Line performance is the rear bumper in the body color front bumpers. You can choose from 12 exterior colors, personalize do you do by choosing from one of four contrasting roof and mullion colors. You can also click the EcoSport now for 18” wheels to choose which ‘m an even more powerful appearance. The rear door is hinged still left open and you can still choose to the spare tire on. Inside the EcoSport is the interior completely re-designed. The materials in the dashboard, look premium and feel also. Only in the doors, there are still parts that are hard plastic, but feel that you only. On the eye they look good and fit well with the rest of the interior. The chairs are nice and give good support. At the request of European customers are the sessions of the, optional, partially leather, heated front seats longer made, so they your legs more support and long rides more comfortable. The dashboard of the new EcoSport is a lot tighter and quieter design than that of its predecessor. Clear-to-read instruments and an optional 8-inch ‘floating’ infotainmentscherm make the Ford all the way this time. Thanks to several clever storage ideas, there is lots of storage space. In the centre console is now a folding and sliding armrest with enough space for, for example, a tablet. The bottom of the boot may be increased, so there is hidden storage space arises. By the soil to decrease, there is 334 litres of space. Thanks to its honeycomb construction, the base can have a weight of 300 kilo bear. 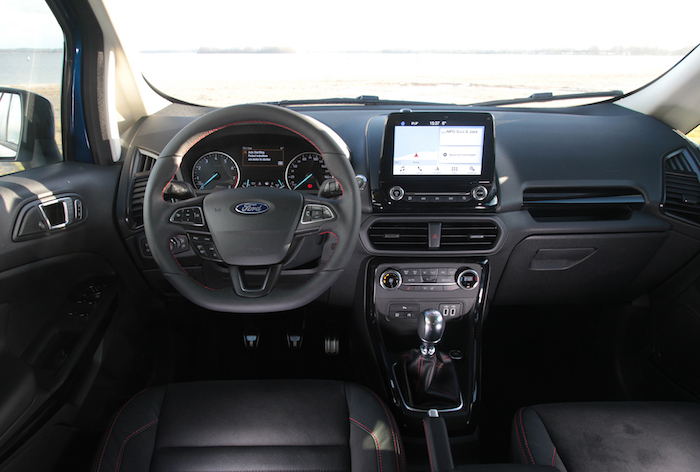 Also on the inside, the Ford EcoSport widely clean, modern, and luxury. How to drive the Ford EcoSport? We drove with the manual 125 hp three-cylinder 1.0-liter model year ST-Line according to Ford, the sportiest suspension. The new EcoSport in this configuration is a fine driving and steering car. The noise level inside the car is comfortably low and you can quietly talk to each other without being disturbed by noise or bandengeluiden. The EcoSport is also available with an automatic gearbox, and in may 2018 is a 100 hp version. The Ford EcoSport is of course equipped with all the required vital driving assistance systems, including Roll Stability Control. This system sends the engine torque and the brakes to help you the car under control. 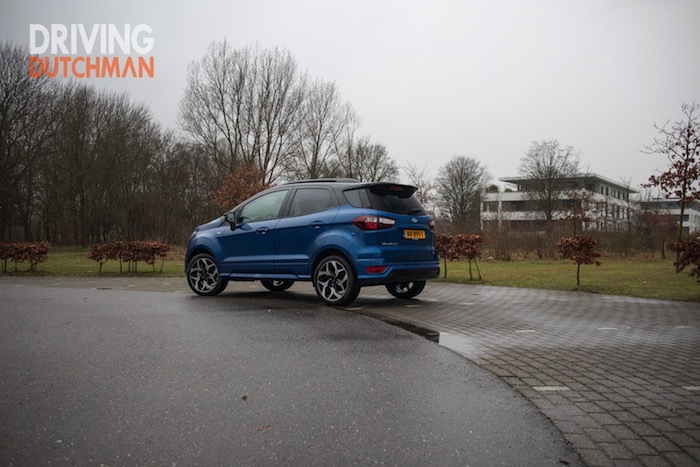 To wish you the EcoSport fitted with a comfortverhogende options such as a rain sensor, automatically inschakelende headlights, appearance pack and heated mirrors. Optional advanced technologies such as Blind Spot and dead angle alert, warn you when something in the environment of the car. The audience decides which car he prefers, but the new Ford EcoSport in the B-SUV segment is currently the most on a real SUV. The EcoSport, there is a whole lot more luxurious now, and the promised quality of experience is a good level. From 21.855 euro am your owner. We think that Ford is the competition with the EcoSport still be very difficult.